A lush green pathway beautified with indigenous Caribbean foliage and flora meanders up to the palatial entrance of the Kimpton Seafire Resort. It’s the latest in a long range of towering resorts adorning what some would argue is the Caribbean’s finest feature: Seven Mile Beach in Grand Cayman. The pathway expands into the sky-scraping entrance with lavish design elements mimicking the indigenous Coccoloba or ‘Seagrape” tree and other natural local earthy elements. As you pass the threshold and the friendly faces of the welcoming staff, you are embraced by clean modern lines of black iron accented with natural materials, nautical motifs (of which the least subtle is the traditional wooden Cayman catboat suspended from the ceiling) and the exceptionally-designed, contemporary lobby – a mere stage set for the expectedly breath-taking tropical hues of the Caribbean ocean. The pathway exiting the lobby, snakes around the glamorous outside pool area dotted with bright red, irresistibly inviting lounge beds, perfect for sun-bathing and lazing the days away with a book and a drink in hand. *Access for guests with disabilities? Adapted wheel-chair friendly rooms available, and public spaces are accessible. 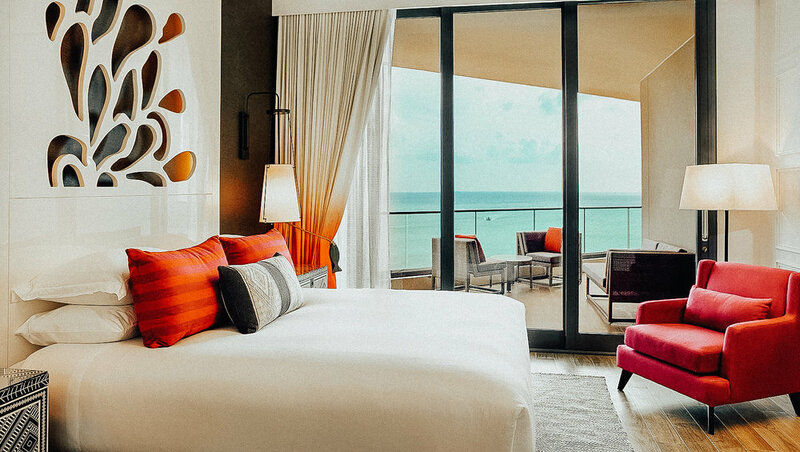 The Kimpton Seafire Resort is family-friendly with vast grounds, commodious facilities and generously spacious guest rooms, as well as a kids' club. The contemporary rooms showcase elements of dark slate, complemented by a bright fuchsia pink. The rooms are contemporary yet inviting and fun. The white headboards reach right up to the high ceilings and feature backlit, abstract floral designs. Accent furniture in tribal-designs tie it the rooms together. Ocean-facing balconies are spacious and offer breathtaking sunset views (be sure to be on the lookout for that special green flash sunset!). Room rates vary from $399* in low season to $499* in peak season. Breakfast not included. Free Wi-Fi. *Rates as recorded on the date of publishing and are subject to change. 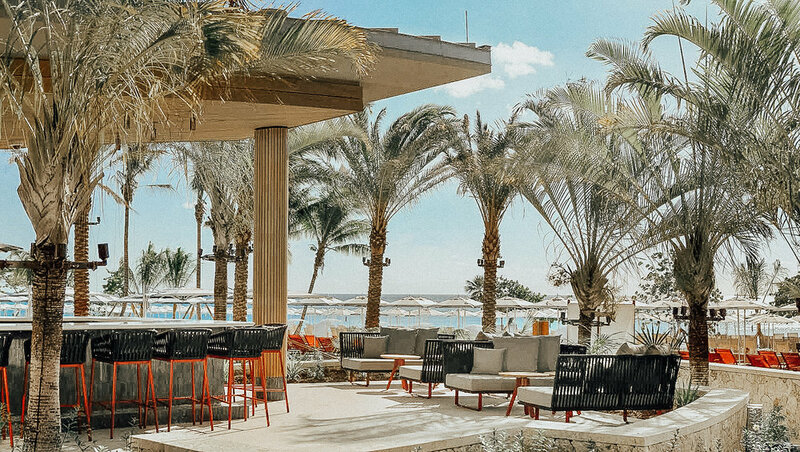 The Kimpton Seafire boasts three exquisite signature restaurants in addition to its pool bar and grab-and-go café. The main restaurant, Ave, serves up Mediterranean food fare. The extravagant daily breakfast buffet includes delightful gastronomical delights that range from items like a jamón (ham) benedict, jerk chicken and delectable waffles, starting at $13. This quaint chef’s counter acts as a ‘petit’ restaurant located within Ave and offers an ambitious menu of delicately crafted cocktails and Spanish tapas that include rich and flavorful dish variations incorporating ingredients such as cuttlefish, wagyu beef and bone marrow. At Coccoloba one is greeted by a fresh ocean breeze on entry. As you step out from this open-air restaurant directly onto the beach, the delicious fragrant smells of the fish tacos, guacamole and sweet aromas of the cocktails greet, excite and delight sun-kissed visitors seeking refuge and refreshment from the heat. The Kimpton Seafire resort is located at the northern fringe of Grand Cayman’s renowned Seven Mile Beach. By taking its surrounds into account from the stages of conception to creation, it has managed the difficult feat of complementing and elevating, as opposed to disrupting the natural beauty of arguably the Caribbean’s finest jewel. Though hard to imagine that one would be able to muster the motivation to leave the comfort and leisure of your beach chair, the allure of the premier restaurants of West Bay and George Town generates just enough pull-power to encourage one to take on the short 10-minute journey to the other side of the island. World class tourist excursions including visits to the bioluminescent bay in Rum Point and charming old Bodden Town can be arranged by your concierge.